Size: 16in x 14in (410mm x 355mm). 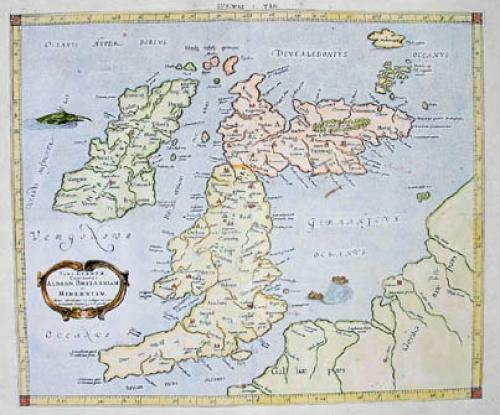 This Ptolemaic map of Great Britain and Ireland was first published by Mercator in the 1578 Gottfried von Kempen edition. This map was published in the later 1695 Helma Strick edition. The plate was reworked from the earlier edition with the replacement of the cartouches with a contemporary 17th century design with text relating to the meridian. The Ptolemaic maps were taken from the text of Claude Ptolemy (AD 87 - 150) a Greek mathematician, astronomer and geographer, living in Alexandria, assembled and codified his predecessors' cartographic theories including those of Marinus of Tyre (c. AD 120). In about AD 150 he published his Geographia, a work in 8 volumes, supposedly illustrated with a world map, 26 regional maps and a profusion of smaller maps. Although the text of the Geographia survived, no maps older than about the twelfth century have come down to us and, in consequence, we have no means of knowing whether the 'Ptolemy' maps on which we set so much store were, in fact, drawn by him or were the interpretations of later map makers using his text as a basis. (Koeman 1998).